Six nights in Puerto Princesa, Palawan. This was a trip I almost didn't want to join. Why? Because 3 years ago, I solo backpacked for five days Puerto Princesa and El Nido. It was a birthday getaway. I spent 2 days in Puerto Princesa to see the Underground River only, the rest of the time was spent for my flight' s arrival and departure . The other 3 days I spent in El Nido, a beach paradise. I almost didn't want to leave, honestly. When Evo, fellow blogger and a local in Palawan announced he's organizing a trip there, it was almost close to my Cebu and Siargao trip schedule. I knew I need to choose given that my money isn't enough to cover both. I initially chose Siargao since it's a province I have never been. In my previous posts, I have shared my goal is reaching all the 81 Philippine province, one at a time. Visiting Siargao in Surigao, means an addition to my record Im trying to achieve without a deadline. However it was badly planned that I ended up not pushing through. My roundtrip flight was courtesy of a complimentary voucher I got from a local airlines. I only paid Php500 for the terminal fee both ways. Now here I am booking a flight out of my own pocket! The itinerary is good for 5 days and 4 nights only but I booked for 6 days and 6 nights because it was way cheaper. I told Evo I will shoulder the extra 2 nights myself since it was my own decision to stay a bit longer in Puerto Princesa. Well, I was lucky because he found another hotel just for me! I stayed 2 nights each in Panja Resort Palawan, Microtel Windham and Citystate Asturias Hotel. In our first day, we had lunch in Viet Ville, used to be a home to many Vietnamese refugees who came to Puerto Princesa by boat in 1970's. There's a Busdhist temple and a resto that offers Vietnamese cuisine. Then we drove to Nagtabon Beach, a remote beach that doesn't have a 24/7 supply of electricity. We went there afternoon already so we had a few hours to swim. We also did a pictorial in the edge of a cliff because of the beautiful scenery of rocks. This is a spot that's dangerous because the rocks are sharp that if you stumble, you'll surely get hurt. These rocks are constantly smashed by waves so it has spikes. On the second day, we did 3 things. 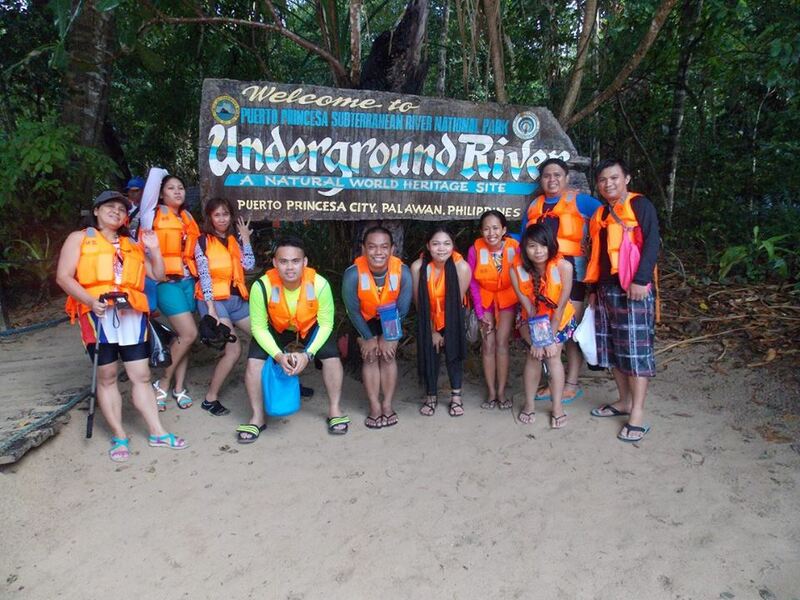 See the Puerto Princesa Underground River which to me doesn't appeal much since I've done it before. In fairness, I have to praise the local government unit of Puerto Princesa. It's still the same one I saw. Though it was raining, I can see the cleanliness of the surrounding water and the 'purity' of the cave. Only difference is guests are now given an audio guide they can listen instead of relying to the tour guide's words. The one I have enjoyed so much is snorkeling at Isla Felomina. I've never done snorkeling, especially if it is just a waist - deep - I will get bored. Here you'll do it on a 10 - meter deep but the water is so clear that you can see even the seabed. Different colors of fishes and large corals mesmerized me. It's like watching the Finding Nemo movie! By evening, we did firefly - watching in Sicsican river. There were fewer fireflies that time but what blew us away was the magnificent view of stars, planets, constellations and who knows galaxy? Imagine your on a boat with a pitch - black surrounding, seeing millions of stars while your guide has a laser pen that glows brightly in the dark. He did a quick lesson of astronomy identifying a lot by pointing his laser pen to the sky like it's just within reach. On our 3rd and final day, we had a Puerto Princesa city tour. We had lunch in Tiya Ising's Restaurant. If you are into Filipino food and We visited Crocodile farm, I just remained outside. I'm not a fan of zoos and animal tourism. Next we went to Irawan ... Here prisoners are doing labor and are literally free to get around the place. This post is just a summary of my trip. I will be definitely creating separate blog articles to feature all the places, restaurants and hotels we've been to. Please stay in touch! Bloggers Caravan Palawan is a success, thank you from all of us who make this trip unforgettable and memorable, special thanks to our savior DanteNico Garcia of #CasaNievesTV and #Kota for everything as in sobra, to all restos, friends and offices who assists us in this first ever Blogging happening in the City of Puerto Princesa. Thank you also to Michie Hitosis-Meneses and the City Tourism Office Ranil Guarino for additional request we've made tru you, Alvin Tan for the support and of course your #PanyaResortPalawan , shout out also to #ArnoldsRestaurant in Baybay, #VietVillePalawan and to May Armada #TiyaIsingsPalawan #LaTerrasse #PPUROffice To Kuya our travel driver and to Rocky, and #MicrotelPalawan where #ModernFamilyGetaway happen, and #AsturiasHotel who serve as our home during the 5 day stay. To other bloggers watch out soon for the Part two this year.